BART listened and they've done something pretty remarkable. MTC and Clipper threatened BART that if they don't end all sales of blue, green, and red discount tickets by the end of this year, they will cut their funding. I argued the transition for adults was poorly thought out and hurts those with commuter benefits. And some people have told me the transit benefit maximum monthly limit is going back down from $230 to $120 a month, and for those who are required to link their commuter debit card to their Clipper card, it means more blocked Clipper cards for insufficient funds or a denied reload. Since BART decided Clipper autoload was the only way to continue getting adult high value discounts (extra $2 in fare money for every $30), that made a lot of people grumpy, especially when there are no other options to load HVD value, such as paying in cash. Good news, BART will continue selling all discount tickets after December 31st! Red and green tickets will still be sold after December 31st at these "My Transit Plus" locations at: Embarcadero, Montgomery, Powell, Civic Center, Bayfair, Walnut Creek, Richmond, and Oakland Coliseum/Airport BART stations. Red and green tickets will also continue be sold at SFO Airport and the main ticket window at Lake Merritt station. Blue high value tickets will continue to be sold at the above listed "My Transit Plus," SFO Airport, and Lake Merritt ticket window. "After December 31, High Value, Red and Green discount tickets won't be available at most retailers." If you read that correctly, the keyword from Clipper is: "most," which means there will still be places in the Bay Area to buy all three types of discount tickets in paper/mag stripe form. The main reason why the high value blue, green, and red paper tickets will still be sold is because of tourists. Since getting a youth or senior card takes time, having the discount tickets will allow those who are eligible to access BART fairly with the proper discount. By having the blue HVD tickets continue to be sold, this allows those who pays with cash or commuter paper vouchers to continue to buy their tickets without being forced accept Clipper as vendors don't accept paper vouchers in exchange for Clipper HVD, and the only method of paying is through autoload. It's exceptionally difficult for those who cannot obtain a commuter debit card to get the 6.26% discount they've been getting for years with paper vouchers. It's time to celebrate! 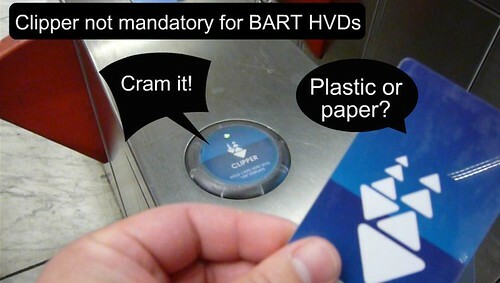 Akit's Complaint Department and people around the Bay Area cried out to BART, and they've done something positive. That's where you're wrong, the HVDs are still being completely phased out. Not the Red and Green tickets though. Did you read the statement from BART? It says it will still be sold. Click on that link and read it for yourself. There have been signs in BART stations/trains with the "most retailers" language for at least a month, so I don't think this is a new decision. There are two passages which stand out when I read the BART press release. The press release states "For infrequent riders and out of town guests, the My Transit Plus locations in our Embarcadero, Montgomery, Powell St, Civic Center, Bayfair, Walnut Creek, Richmond, and Coliseum Stations will continue selling red and green tickets indefinitely." I emphasized the passages which caught my attention. Contrast that to the paragraph where they discussed HVD tickets. "If you get transit benefits through your employer, you can continue buying high value discount tickets at the locations listed above." Once again, emphasis added by me. First, the red and green tickets will continue to be sold indefinitely whereas the absence of that word implies the phase-out of HVD tickets is already planned or being contemplated. Second, it seems as though receiving "transit benefits through your employee" is a precondition of buying HVD tickets. I take that to mean you will need vouchers or a commuter benefit credit/debit card to buy the HVD tickets.